Todd Spoth broke out and learned something outside of his comfort zone. This is what happens when you're the only one with a still camera. 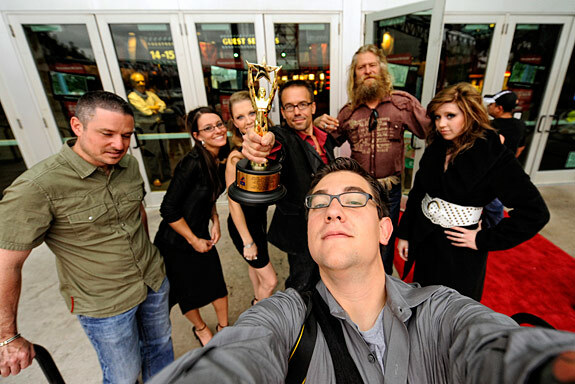 Spoth and part of the crew, with friends, before the encore showing of the film during the 2009 Worldfest International Film Festival. Photojournalism was an uphill battle for me from the beginning. As a junior at the University of Houston, majoring in Political Science and Psychology, set to attend law school, I came to the realization that I didn't have anyone to impress, but myself. I needed to do something that I loved. Being completely self-taught, I envied my younger cohorts in the big photo programs, I was struggling to understand how to put together a photo story and they had a whole class devoted to them. I would have traded my Russian foreign policy courses for a class on photo stories in a heartbeat. But, I knew I was going to have to fight to actually compete in this tough business. I was getting beat out every season for the internships I was applying for and when I actually got to the point where my portfolio was decent enough to compete, I was graduating and for the majority of internships, I quickly became ineligible. I did, however manage to get a few breaks here and there, and it was during my first internships that I stepped back and looked at things realistically. It wasn't hard to see that hard times were on the horizon for the economy as well as the industry as a whole, and that the business was looking to new revenue streams to maintain profitability. I have always been a proponent of multimedia and video. It excited me, and I love to learn new skills. I made a list of things I wanted to learn, a list of resources to learn from, and a list of skills I thought the normal newspaper photojournalist transitioning to multimedia would not likely seek out. Things on the last list are arguably less relevant to the traditional journalist, but I wanted to have skills others didn't, such as knowledge of specialized programs like Adobe After Effects, creative titling and editing, and 3D graphics, among others. I took my own time and learned what I wanted, how I wanted to. I worked through a few internships that provided me an adequate training ground and outlet for what I was learning. Most of the time, the multimedia or video pieces weren't directly assigned, but I pushed myself to produce them anyway, even if some never made it to the web. A newspaper provides a nice platform for presenting multimedia to the photographer breaking into the medium, but I was looking for something bigger...or at least, different. The opportunity presented itself after moving back to Houston following an internship with the Colorado Springs Gazette. A client and friend of mine in Houston, Shawn Welling, was researching a new documentary project and asked me to come on board. Shawn had previously produced an award-winning documentary based on the life of his hip-hop dance studio, Planet Funk Academy, but he envisioned something different for his next project. Promotional poster created from a still image of main character, Michael Pickering. Image and Design by Todd Spoth. Starting in January of 2008, we began documenting the lives of a handful of interesting characters on the Bolivar Peninsula, a small landmass just northeast of Galveston Island on the southeastern coast of Texas. We had been following these characters for nearly 9 months, making the hour trek from Houston about twice a week. Then Hurricane Ike made landfall on the Gulf Coast. Bolivar took the brunt of the storm and was completely decimated. The homes and subsequently the lives of our three main characters were destroyed under a 20+ foot storm surge. The days following Ike saw an unprecedented media blackout. We were able to get a helicopter into the area before a lot of news crews. 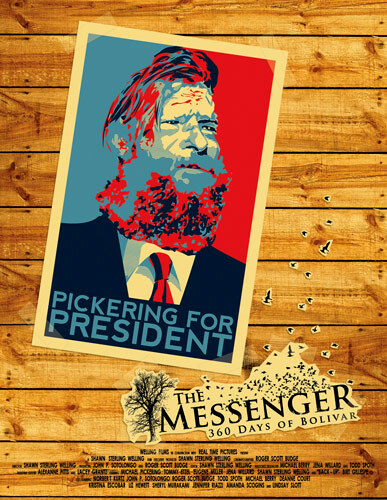 We continued to document throughout Ike's landfall and the aftermath, conducting our final interview on Bolivar exactly 360 days since our first day, hence the name of the film, The Messenger: 360 Days of Bolivar. After that final interview, we began the daunting task of editing and building our film. The sheer volume of footage - thousands of stills and hours of video - that we captured during our time in Bolivar was a challenge in the cutting room. For weeks we milled over the footage, mixing stills and video into a cohesive production. The Worldfest International Film Festival was fast approaching and we agreed that we wanted to complete the film in time to enter it in the 2009 festival. We were ecstatic, when we heard that our documentary was an official selection of the festival. It was a great honor given the festival is the second oldest film festival in North America (1961) as well as the place where Steven Spielberg, George Lucas, Ang Lee and a many other great filmmakers all won their first awards. Our film premiered on April 19th, in front of a sold out, 500-seat, theatre. During the weeks preceding and following the premiere we were shocked to receive a great deal of media attention. It's pretty weird to see your name in the paper without a photo on top of it. We appeared on several television programs promoting the film and were invited back for an encore screening the following weekend. The day before the encore screening, we attended the film festival's annual awards gala. It was a grand night of meeting actors, producers and other filmmakers that was highlighted when we were presented with a Gold Remi for Best Docu-Drama. The feat of editing a cohesive film from a huge collection of footage was enough, but winning an award was the icing on the cake. So many amazing things happened during the course of the film festival, it would be tough to try and spill them all out here, but one definitely stands out. An older lady pulled me aside following the initial screening to congratulate me on the film and express her liking for the work. She turned out to be in charge of the selection committee for the Sundance Film Festival and invited us out to next year's festival. The opportunity to be a part of a production like this has been incredibly rewarding and valuable for a million different reasons. I am thrilled that the response from viewers has been so positive. My journalist side is definitely proud to have given these men a voice and to have told their stories with the truth and dignity they deserve. My eager student side is incredibly happy to have had the chance to sink into a smorgasbord of diverse tasks I otherwise would not have had the chance to pursue. While my official title on the project is Associate Producer, I shot over 10,000 still images for the project, including documentary stills of the men, behind the scenes material and promotional images. I designed a number of the promotional posters for the film as well as several other graphic pieces, and I filmed a number of scenes (some on my Canon 5D mark II), and countless other mini-projects within the year-long process. 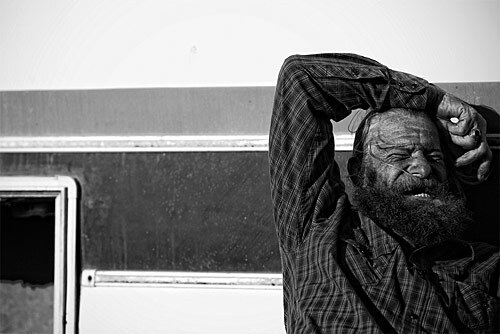 Main character, longshore fisherman, Michael Pickering, in front of his now-destroyed, Bolivar trailer home. Whether or not the knowledge of setting up 40-foot cranes, drafting press releases, designing promotional apparel (that was never printed) or jokingly yelling for a non-existent craft service presents itself later in life, it was a fun learning process. I thoroughly enjoyed soaking up the experience, no matter how many frustrating hours I waited in line for the Port Bolivar ferry or how many nights I wanted to punch Final Cut Pro straight in the face. Who knows where we go from here. The future is uncertain for our film as well as for me. We are planning several other film festival appearances and are entertaining a few distribution offers. We already have plans to start another project soon. With the lessons learned, the experience in tow and a few new friends alongside, Ill continue to teach myself whatever I need to in order to be ready for another great adventure, in whatever medium it presents itself. Whether you call yourself a photographer, videographer, photojournalist, visual journalist, or whatever trivial label, we are all creative people. We all have (or at least should have) that natural je ne sais quoi inside of us that prevents us from having to sit in a cubicle from 9-5. So be creative. Illustrate, design, produce, draw, sketch, do something different. Break out and learn something outside of your comfort zone, because you never know when you're going to need it.